This topic is a nice change from the previous three process type subjects (testing and test items). It has been my experience that most instructional design models don’t address the topic. Information on presentation techniques and an instructor’s behavior are usually found in the communications theoretical basis. The goal for this blog is to acquaint you with the dimensions of instructor credibility and provide you with methods to enhance it. My blog on the Introduction to Communications Theory will act as a basis to build from. To make the most of this blog you need to have a model of communication to reference and know the attributes and role of the sender and receiver. 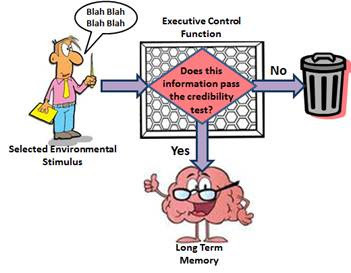 Credibility refers to the objective and subjective components of the believability of a source or message. Instructor credibility has to do with ability to leverage personal conduct, social practices, professionalism, and contact expertise to command attention and respect from the learners. 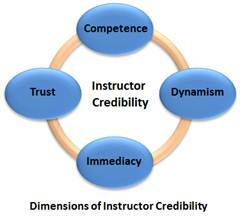 There are four major dimensions of instructor credibility: trust, competence, dynamism and immediacy. Trust is defined as "placing confidence in the other". Trust must be earned through the pedagogical communication process that teachers display with their students. Any violation of this trust can potentially rupture the professional relationship that teachers need to maintain if honest dialogues are to occur. Competence involves more than simply being knowledgeable. It involves a perception that others have of people concerning their degree of knowledge on topics, abilities to command such knowledge, and abilities to communicate this knowledge clearly. Teachers constantly face being evaluated and tested by students, concerning their level of knowledge on a variety of subjects. Dynamism basically is the degree to which the audience admires and identifies with the source's attractiveness, power or forcefulness, and energy. This dimension correlates strongly to a person's level of charisma. Immediacy is the level of distance both physical and psychological between himself or herself and the student. The following table is a compilation from various books and articles of examples and suggestions for increasing one’s credibility by dimension (see references below). As the adage goes, you only get one chance to make a first impression. So don’t waste it! In my opinion, the good practice of gaining your audiences’ attention by stating an “interesting fact or surprising statistic” gets abused by just spouting facts. I think of our typical safety meeting that starts with some obscure statistics about how many “whatevers” happen every year. I guess they forget about the interesting and surprising part. I think Heath & Heath(1) suggest a better alternative “When we’re trying to build a case for something, most of us instinctively grasp for hard numbers. But in many cases this is exactly the wrong approach.” Let the learner test your ideas. Instead ask a simple question that allows the learner to test for themselves. I think one of the results of the information rich society is that our learners are less impressed by credentials. Allgeier suggests, “Your position, status, or roles in life have nothing to do with your personal credibility factor. Different people play different roles in their careers, jobs, and other activities—and some are roles of very high authority—however, there’s no lasting connection between higher status/power and personal credibility (2).” You gain or lose credibility through your behavior. Instructor credibility must be earned in the classroom. Credibility is one of 14 competencies identified by the International Board of Standards for Training, Performance and Instruction (IBSTPI). Ask one of your peers to review the competency dimension table above and identify an area you can improve in. Set a SMART goal to improve that area. (1 )Heath, C. & Heath, D. (2007) Made to Stick; Why Some Ideas Survive and Others Die. Random House Publishing. New York, New York. Haskins, W. (2000, March 3). Ethos and pedagogical communication: Suggestions for enhancing credibility in the classroom. Current Issues in Education [On-line], 3(4). Available: http://cie.ed.asu.edu/volume3/number4/.